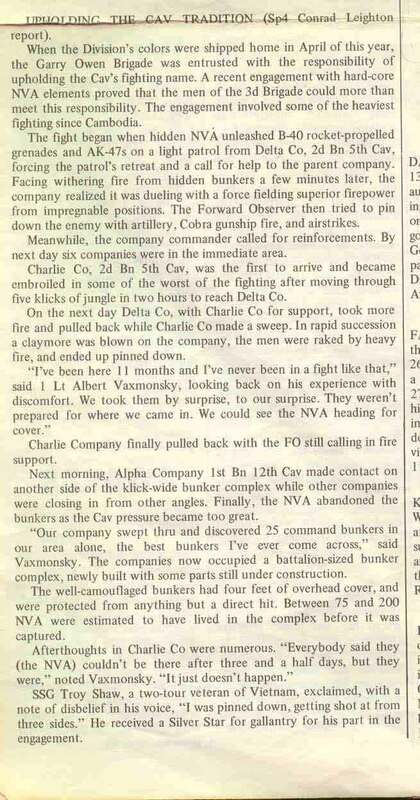 In the first major battle since the departure of most of the 1st Cavalry Division, Charlie Company sustained losses while fighting in a bunker complex against NVA troops. The 2nd Battalion 5th Cavalry was working out of both FSB Evelyn and FSB Furr in the vicinity of Xuan Loc, northeast of Saigon, in Long Khanh Province. Both C 2/5 and D 2/5 were patrolling. As usual, both companies were split into two groups - one platoon working by itself, and the rest of the company patrolling together. At 6:30 in the evening, some members of the 2nd Platoon of Delta Company were out setting up and automatic ambush when they spotted two North Vietnamese soldiers. Though they shot at the NVA, they didn't know if they hit them. Twenty minutes later, the D 2/5 night defensive position received between 8 and 10 60mm mortar rounds, and had three men lightly wounded. Fifteen minutes later, received 2 more rounds hit. It was obvious the NVA were watching Delta Company closely, and LTC Leonard Wishart ordered the 2nd Platoon to move to the main company NDP for the night. Delta Company moved out in search of the NVA. At 9 AM, the company came under heavy small arms, automatic weapons, and B-40 RPG fire and took numerous casualties. Three of the wounded were exposed to enemy fire, and attempts to rescue them brought heavy fire from the NVA. In a short time, Delta Company took 12 wounded, including the Company Commander. Nine of the wounded had to be Medevac'd immediately. Almost 3/4 of one platoon was killed or wounded. Armed helicopters were called, including gunships from the 2/ 20th Aerial Rocket Artillery (Blue Max) and a Pink Team (one low Loach bird and a "top" Cobra gunship) from the 1st Squadron 9th Cavalry. At 12:30, Charlie Company was picked up from the field by Huey and taken to an open field about 5 kilometers away from D 2/5. They began to move towards Delta Company as quickly as possible through the heavy jungle. 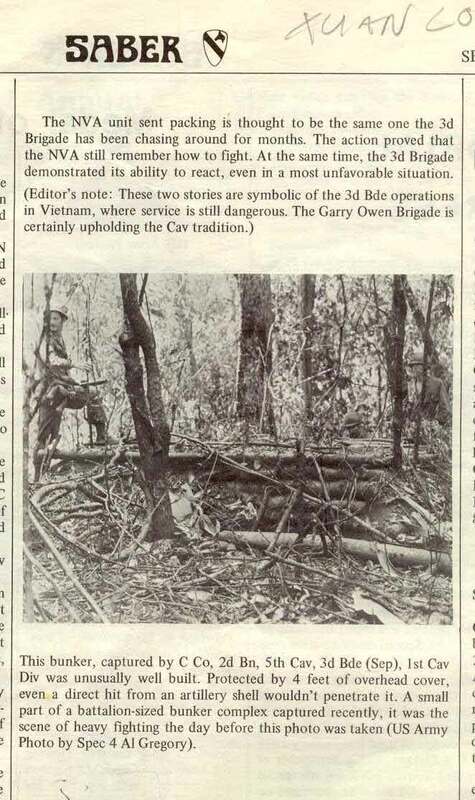 Company A, 2nd Battalion 12th Cavalry, was attached to 2/5 Cav, and moved into position to block NVA trying to escape to the north. At 3:15 in the afternoon, a patrol from Delta Company had more contact, resulting in two more wounded. The patrol pulled back to the main company position and an air strike was called in. By that time, Charlie Company had closed with Delta Company. Because the Delta Company Commanding Officer was one of the evacuated wounded. LTC Wishart ordered CPT Romeo Trevino, the Battalion Intelligence Officer, to take temporary command of D 2/5. 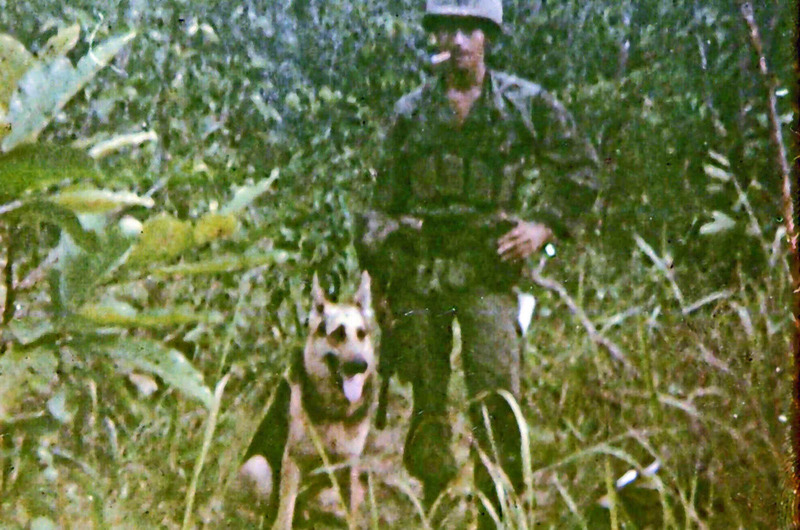 CPT Trevino had been the leader of 2nd Platoon of Charlie Company in February 1971. LTC Wishart, CPT Trevino, and Charlie Company's CPT Vic Allifi met to discuss plans for the following day. The two companies stayed in the same night defensive position. Both C and D companies moved out in the morning and crossed a river to get to the bunker complex. Delta Company would set up in a blocking position to prevent enemy troops from escaping while Charlie Company drew the task of assaulting the bunker complex and retrieve the bodies of the D Company KIAs. At 10:15 AM, Charlie Company was hit hard by B-40, AK-47, mortars, and RPD fire. Helicopter gunships and an air strike were called in to pound the bunker complex. In the meantime, Delta Company was mortared. But, the mission was accomplished and the bodies of the dead Delta Company troopers were brought back. Both companies moved quickly to clear the area before F-4 Phantom jets napalmed the bunkers. The toll on Charlie Company was heavy. Medevac was requested right after the fight began and 12 wounded were taken out, while five more wounded stayed in the field. Worse, Charlie Company had one of our troopers missing in action, though it was well known he was KIA, but his body had not been recovered. Once again, C and D Companies set up a joint night position while the bunker complex was blasted by artillery all night long. It was obvious the enemy moved out from the bunker complex. By morning, Company A 1/12th Cavalry, acting as a blocking force to the north, took fire, as did helicopters in the area. Both C and D Companies were able to move back into the bunker complex without any resistance. NVA bodies were found. Intelligence gathered from the scene indicated the enemy was from the 33rd NVA Regiment. Sadly, Charlie Company also recovered the body of SP4 Floyd Bradshaw. His body was taken to the 24th Evacuation Hospital at Long Binh. Click on picture to see larger version.